My favorite all-time snowmobile models are the very ones conceived and constructed by Wisconsin’s Carl Eliason back in the 1920s and eventually ending in the 1960s. Despite what some may think, I was not around when Eliason built his prototype. It would have been interesting to understand his thinking and problem solving. Truthfully, my admiration of Eliason and his power toboggans comes late in my snowmo-writer career. Like many snowmobilers, there is knowledge of the Eliason contributions that go back decades. Every once in a while the New Hampshire Snowmobile Museum will host winter gatherings where collectors bring in pristine examples of these primitive-looking over-snow vehicles. At first glance, the Eliason seems incredibly ancient, more so than a vintage Ford Model T. The reality is that when Carl Eliason built his prototype “power toboggan” in 1924, Henry Ford already was manufacturing his 10 millionth Model T! When Eliason built his 1924 prototype, Henry Ford already had manufactured 10 million Model T cars, including some used as “snowmobiles.” Bassett Image. And, in 1924 One US dollar had the buying power of $12.67 in 2011 money. That’s one of the reasons the Eliason concept remains remarkable. It’s unlikely that Carl Eliason was thinking about his influence on future snowmobiles back then, but it is undeniable that his design continues to resonate with modern 2012 sleds. We had seen pictures of the Eliason. But, it wasn’t until we saw the actual vehicle at a snowmobile event back in the 1990s, when began to understand just how prescient this entrepreneur had been. We are quite comfortable in believing that Eliason’s designs and subsequent patents were made to solve problems. In the history of the Eliason snow vehicle, you can see how the design evolved slightly to set the stage for today’s modern machines. Carl Eliason’s incontrovertible design concept lives on. We find that description just too simple. Think about it. What does every modern snowmobile feature? A forward-mounted engine? Most are now liquid-cooled four-strokes. The rider sits over the track, though now in a modified “rider-forward” position. What about the track and suspension? There is a slide rail system inherent in every design. Although many sleds of the 1960s and into the 1990s used wheeled track suspensions until the Arctic Cat Panthers popularized the full production of a slide suspension in the mid-1960s, it was Eliason’s cleated track with slider guides that preceded that design. When the Eliason ended production in the early 1960s, the design had evolved to the “K” series, named for the Kitchener, Ontario facility where it was built by FWD. 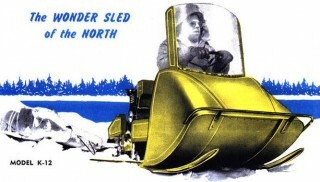 Up to 1950 and the all-new K-10 model, the Eliason power toboggan remained “pure” to the original concept. But to literally gain more traction and sales the revised design used a rear-mounted engine and the 1953 K-12 looked amazingly like the mid-1950 Polaris Sno-Travelers and the Polaris-influenced early 1960 Arctic Cat utility sled designs. These “new” Eliason models came with a Salsbury belt-drive clutch and a 6-hp engine mounted behind the driver and placed directly over the track. When the recreation-oriented, light-footed Ski-Doo arrived, it marked the end for the utilitarian Eliason. Bassett Image. According to the Eliason historical record, by the mid-1950s many of the company’s patents were expiring and sales slowed, making the K-12 effectively the last of the Eliason sled line. But it was the K-12 that others used as a guide to creating their own utility models. With the arrival of Ski-Doo’s “light-footed” recreational-oriented snowmobile, the Eliason faded into the background. It was an incredible machine. Look at what this one design contributed. The front-mounted engine layout. When “modern” designers changed over from utility to play sled designs, the engine moved from behind the rider to a position in front. Of course, many sleds, including the vastly popular Ski-Doo moved the engine ahead on the existing tunnel, leaving little weight over the skis for turning power. Arctic Cat would extend the engine position out and lowered more to give some bite to the front end. That was an early Eliason concept. 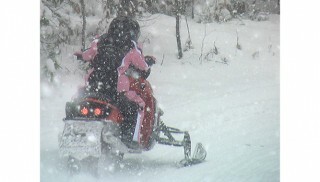 The modern snowmobile utilizes two skis linked back to a handle system, a concept evolved over time from the Eliasons, which used a variety of links such as rope and levers and a steering wheel. Had Eliason decided that one ski would do the job, would we have single ski sleds today? And his track concept was probably borrowed from conveyor belt systems of the day. While the use of a track rail guide predates the sophisticated parallel rail slide designs of today, this necessity remains as a design tool in virtually every modern sled. The location of the components is remarkable. When you look at an Eliason, you probably don’t ask why certain things are positioned as they are. It seems logical because that’s where sled engineers place them now. The radiator on the earliest Eliasons had to go in front for cooling purposes. Actual radiators still sit up front on a modern sled, although new durable materials and sled engineering have given us aluminum cooling extrusions that can be placed under the running boards or under the seat among other places. Obviously Carl Eliason had to utilize engines of the time, such as the water-cooled, outboard motor sourced for the prototype. Later engines were also based on availability and accounts for models powered by Indian motorcycle V-twins. Isn’t it ironic that the first popular production over-snow vehicle relied on a four-stroke engine? When you look at the Eliason, note how power goes from the engine to the track. There’s a familiar front chain-drive axle. Granted his first sled lacked a nifty CVT drive/driven clutch system, but not all pieces had been invented at the time. Most drive belt systems of the day consisted of friction drive where a lever is used to engage a rotating belt. When items like the Salsbury clutch came along, Eliason sleds incorporated them into their functionality. It may not look like it, but the modern 2012 Arctic Cat XF1100 owes a lot to Carl Eliason’s design concepts. Bassett Image. The Eliason is awe-inspiring. Does it really matter why or how Carl Eliason arrived at his design? 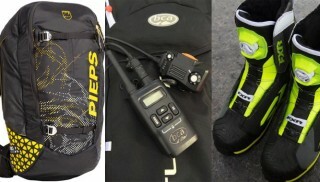 The fact is he established concepts that still account for virtually all modern sled designs. What we have now are greatly improved versions of his original that can accommodate power to take us beyond Sir Malcolm Campbell’s 1924 land speed record. How could any other snowmobile be more significant than the Eliason and how could any other inventor be so significant in the history of the snowmobile?